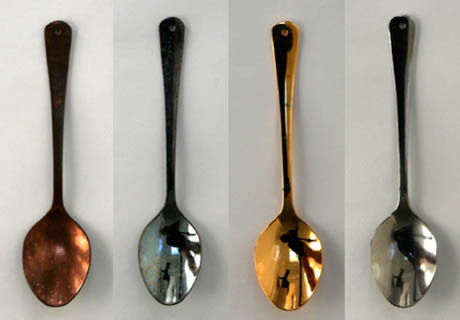 IMAGE: Copper, zinc, gold, and stainless steel spoons; from “Tasting spoons: Assessing how the material of a spoon affects the taste of the food,” by Betina Piqueras-Fiszman, Zoe Laughlin, Mark Miodownik, and Charles Spence, published in Volume 24 of Food Quality and Preference. In a private room at Quilon, the Michelin-starred restaurant in London, guests tried seven courses of delicately spiced southwest Indian food with seven different, freshly polished spoons: copper, gold, silver, tin, zinc, chrome and stainless steel. […] The sight of 15 adults sucking their spoons like babies was an unusual start to a dinner party, but they had surprisingly different flavours. 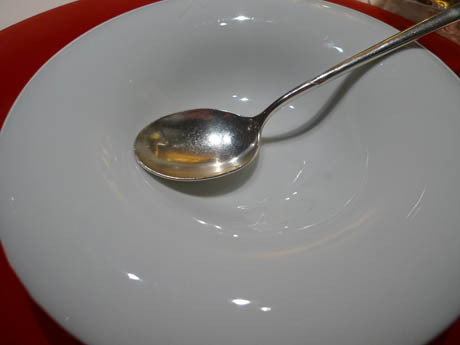 IMAGE: “Rien,” a dish by chef Denis Martin consisting of a spoon coated with an invisible flavour. Photo via. The dinner was organised by Dr. Zoe Laughlin and Professor Mark Miodownik, co-directors of the Institute of Making at University College London, as part of their fascinating and ongoing research into the sensoaesthetic properties of materials, or how a particular metal’s physical properties influence the way we perceive and interact with it. 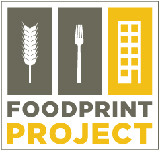 Following on from experiments with the acoustic properties of tuning forks, Laughlin, Miodownik, and their collaborators Martin Conreen and Harry J. Witchel published a paper in the journal of Food Quality and Preference in 2010, reporting their findings from placing electroplated teaspoons into the mouths of thirty-two volunteers in order to investigate the taste of solid metals. Previous studies have suggested that some metals in solution actually produce a “metallic” taste — a distinct sensation to add to the standard sweet, sour, bitter, salty, and umami descriptors. 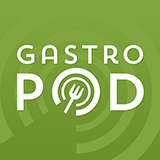 This is still a controversial idea in the world of sensory science, where umami took nearly a century to gain official recognition, although among water engineers iron and copper are known to affect the taste and consumer acceptability of drinking water. 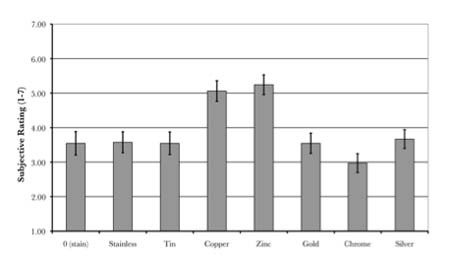 IMAGE: A chart showing the subjective ratings of each of the eight spoons in response to the adjective “metallic,” from “The use of standard electrode potentials to predict the taste of solid metals,” by Zoe Laughlin, Martin Conreen, Harry J. Witchel, and Mark Miodownik, published in Volume 22 of Food Quality and Preference. 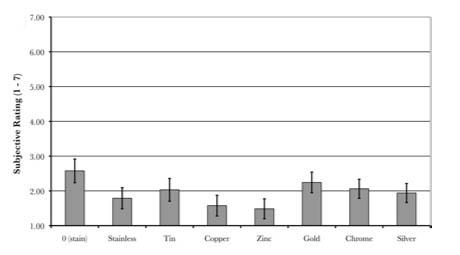 Copper and zinc spoons were rated as the most metallic tasting. In any case, Laughlin, Miodownik, et al. wanted to test the taste of solid metals. They speculated that metals such as copper and zinc that were less stable, and thus more likely to acquire electrons, would taste more metallic because their atoms would form a solution in human saliva more readily. Their blindfolded spoon-eaters (with each lick of a spoon, as Miodownik explained to Dunlop, we are not just tasting metal, but actually “consuming ‘perhaps a hundred billion atoms'”) confirmed the scientists’ suspicions, rating the less chemically active gold and chrome spoons as the most pleasant and sweet tasting, and the more reactive copper and zinc as bitter, strong, and metallic tasting. IMAGE: A chart showing the subjective ratings of each of the eight spoons in response to the adjective “sweet,” from “The use of standard electrode potentials to predict the taste of solid metals,” by Zoe Laughlin, Martin Conreen, Harry J. Witchel, and Mark Miodownik, published in Volume 22 of Food Quality and Preference. 0 (stain) refers to the initial stainless steel control teaspoon, which was used simply to habituate the participants to the sensation of tasting and rating an empty, room-temperature, metal spoon. Gold and chrome were rated as the sweetest, with tin a close third. Not content with ascertaining the taste of different metals in isolation, in their next study Miodownik and Laughlin moved on to look at the way they might affect the taste of food. Astonishingly, despite the fact that, for a sizeable proportion of the world’s population, most interactions with food take place via the medium of metal cutlery, very little study has been made of how different materials augment, enhance, or dull the taste of the dishes they are conveying to our mouths. 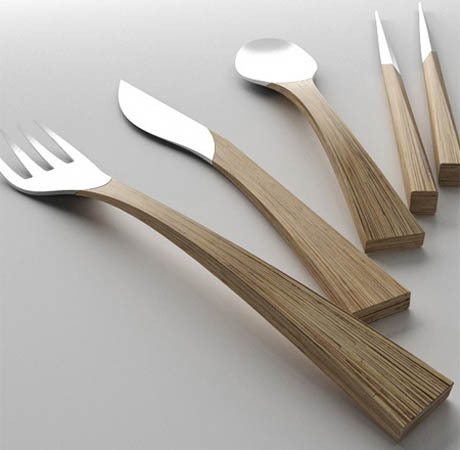 IMAGE: Contemporary cutlery design incorporating wood by Spanish designers Clara del Portillo and Alejandro Selma, via. Wood, bone, and ceramic spoons were commonly used before the introduction of stainless steel as a metal for cutlery in 1914. The more metallic tasting copper and zinc spoons enhanced or added bitter qualities to each of the creams, as expected, but — to the scientists’ surprise — they also boosted its dominant taste. In other words, the sweet cream was perceived as being slightly sweeter when eaten from a copper or zinc spoon than a gold or stainless steel spoon, while the salty cream tasted saltier. 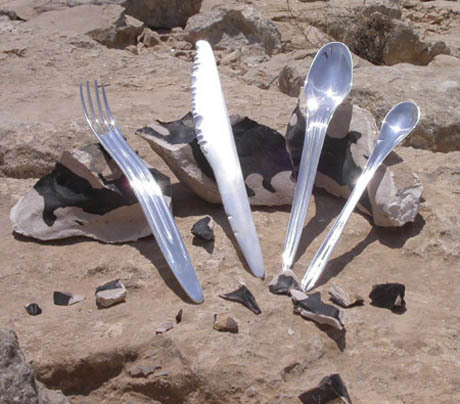 IMAGE: Origin cutlery inspired by the “very first human feeding means: the teeth, nails, concave hand palms, spears, and seashells,” by Eynan Kimhi, via. 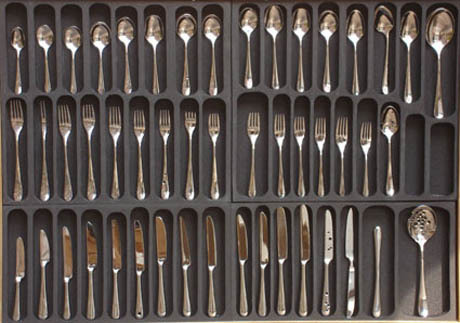 It’s not hard to imagine the impact of these findings on the design of cutlery. Just as Riedel has dramatically increased the number of wine glasses an enthusiast feels compelled to purchase by matching grapes to glass shapes, will wedding registries of the future be padded further with gold-plated dessert spoons, zinc sauerkraut forks, and stainless steel steak knives? IMAGE: evo-cut, “a one-off set of cutlery designed according to the principles of population genetics and natural variation” by Harry White. Laughlin and Miedownik certainly think so, and hope to produce their own set of spoons, accompanied by tasting notes and recipes. They also speculate that, with further research, metal-food interactions might be used to redesign the openings of drinks cans and the liners of tinned foods. Meanwhile, Charles Spence, a professor of experimental psychology at Oxford University and a fellow spoon researcher, has also recently shown that increasing spoon weight makes yogurt seem to taste thicker, sweeter, and more expensive, which suggests that, one day, super chunky, salt- and sweet-boosting copper cutlery might even be prescribed as part of a healthy diet. IMAGE: An aluminium nitride wafer cutting ice, and a chunk of Aerogel (via the Institute of Making and Boing Boing respectively). For Laughlin and Miedownik, however, these spoon studies are part of a larger mission to expand materials science beyond its focus on physical and structural properties and encourage the development of an entirely new set of materials optimised for subjective qualities such as taste or tactility. Their research and programming is intended to inspire those who design at a variety of scales and disciplines, from molecules to buildings, and cutlery to cities, and their materials library, which is scheduled to open its doors to the public later this year, already contains such wonders as an aluminium nitride wafer, which conducts heat from a hand so efficiently that you can use it to cut ice like butter, and a chunk of Aerogel from NASA’s Jet Propulsion Laboratory of NASA that is the world’s lightest solid, weighing only three times more than air. 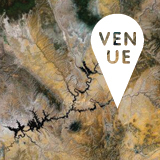 I can’t wait to visit! This is very interesting. I have a couple of unorthodox spoons in my drawer: an ornate china one that I found in a bazaar and sometimes like to use for soup, and a simple wooden one that goes well with ice cream and yoghurt. I’m not remotely fussy about using them, and normally default to ordinary spoons, but I’ve wondered what it is about the different materials and textures that makes me associate them with certain food types. Before immediately ridiculing John Cleese for claiming (in a wine documentary) that the glass affects the taste of a wine, we tried the experiment with three different glasses and a couple of wines and were astounded at the difference in taste. (Maybe more astounded than otherwise because our enemies describe us as hard-nosed engineering-types.) I’m surprised that nobody has thought to look at cutlery systematically before—though because we eat most things with our hands (south and west Asian food), silverware is of less interest than glasses. Thanks for sharing, keep up the good work. I do not use a metallic (= stainless steel) spoon to eat my morning yogurt. The metal makes the yogurt colder and tarter while my spoon of choice — cornstarch based — imparts a creamier flavor and texture, and, no cold teeth. Very cool research, thanks for sharing.